1- Our real talent and hope that we have cherished as a child was to write scripts for the movies. We always wanted to write scenarios and screenplays. Yet, our upbringing within a family whose members were educated at and graduated from Al-Azhar University and most of them were sheikhs did not allow anything but our being educated at Azharite schools and Al-Azhar University; this was the family tradition. Growing up and working as an assistant professor at Al-Azhar University, many were astonished to find us open-minded, unlike most Azharite graduates and sheikhs. Our passion for screenwriting was mainly the reason. Since our childhood, we hated very much the Azharite curricula, but we had to respect the family wishes and be an excellent student throughout stages of Azharite education, like the rest of the family members. In Azharite schools exams, we used to write the model answers required as per the Azharite silly textbooks, followed by our own personal opinion. Hence, our fate in passing or flunking the exams was at the hands of those teachers correcting the papers in all subjects. We briefly say here that we had the second highest grades on the level of all Azharite preparatory schools in Egypt in 1964, and the fourth highest grades on the level of all Azharite secondary schools (within the old system of five-year Azharite secondary stage) in 1969. Upon entering Al-Azhar University, we have chosen the History Department, because it is nearer to our literary talent and artistic passion. Throughout the four years of study at the History Department, we had the first grades above all the rest of our fellow students, until we received our degree (general grade: Very Good) with highest honors. Soon enough, we were appointed as a teacher at the History Department, Al-Azhar University, and begin to prepare for post-graduate studies to get the MA and PhD degrees later on. 2- Our literary talent and artistic passion were the two features that made us an outstanding researcher in history of Muslims, with an eye for what is being overlooked by others who did postgraduate studies. We began at the time to examine historical figures (including the so-called 'saints', imams, theologians, and the so-called companions of Prophet Muhammad) as ordinary mortals who can err and commit mistakes (and never infallible) that lived within a certain cultural and historical frame, influenced inevitably by it. This was the basis by which we have examined all deeds and words of all historical figures, and we considered ourselves lucky to live in the 20th century, using all possible research tools and knowledge accumulated from all civilizations, and hence, we are in a position to criticize and judge all acts and mistakes of historical figures that lived in the Middle Ages. Our literary talent and artistic passion that have made me an open-minded outstanding Azharite sheikh and researcher of history were also the cause of our intellectual battles that we fought while carrying the banner of religious reform, as we rammed our head against the more-than-1000-year-old Al-Azhar institution, the most ancient, Vatican-like, powerful authority in the Sunnite world of the Muhammadans worldwide. Our intellectual, peaceful jihad for reform has begun in 1977 until now, and we have paid a heavy price for it, even now by being in exile as a political asylee in the USA, away from our extended family members and our fellow friends in Egypt, our homeland that we hindered from visiting it. 3- After tendering our resignation from Al-Azhar University in 1987, we lived from 1989 to 1995 in abject poverty as we found no job, because of Saudi and Azharite influence. We spent our time writing scenarios to fulfill our desire of becoming a screenwriter one day whose works would be made into TV series and movies, and we needed at the time to earn money from our screenplays and to engage into this creative writing to dispel the gloomy, depressing atmosphere looming and hovering around us. We harbored great hopes of earning money out of these creative writings to go on with our intellectual struggle against extremism and Al-Azhar obscurantism. After writing several screenplays for movies, we failed to sell them because we knew no one at the time within the artistic field of the Egyptian cinema. When we made many acquaintances and our name has become known because of our work at the Ibn Khaldoun Center, in Cairo, our very name was behind our unable to market our screen plays; no one liked to link a TV series or a movie to an Azharite Quranist sheikh and a Muslim thinker, and a troublemaker whose name is frowned upon by Egyptian authorities and Al-Azhar. Many eye brows were lifted in amazement when we asked all our acquaintances for help marketing the scenarios or recommending them to those interested, because no one among Egyptians we used to know in the 1990s expected us to have written screenplays for movies. We asked for the help of the playwright Ali Salem, the filmmaker Radwan Al-Kashef, Dr. Ahmed Youssef, Dr. Hussein Abdel-Qader, Marxist activist, thinker, and journalist Dr. Rifaat Al-Saeed, Marxist author Dr. Sharif Hatata, film critic Dr. Ali Abou Shadi, and art critic Kamal Ramzy. We sent three screenplays for superstar Adel Imam, and sent them again to the Coptic tycoon Eng. Naguib Sawiris, and the one who carried them to him was our mutual Coptic friend Ramzy Zaqalama. At last, through our friend the artist/composer Muhammad Noah, we made the acquaintance of the young filmmaker Kareem Diaa Eddine, who is a well-off producer and director who received his education abroad from an American university. He owns now the famous film studios in Cairo, Studio Misr, the first and most ancient and glorious film studio in the Middle East. In fact, Kareem Diaa Eddine has bought it from the Egyptian State, after it was ruined by the governmental public sector, and this brilliant filmmaker has modernized, renovated, and rejuvenated it. 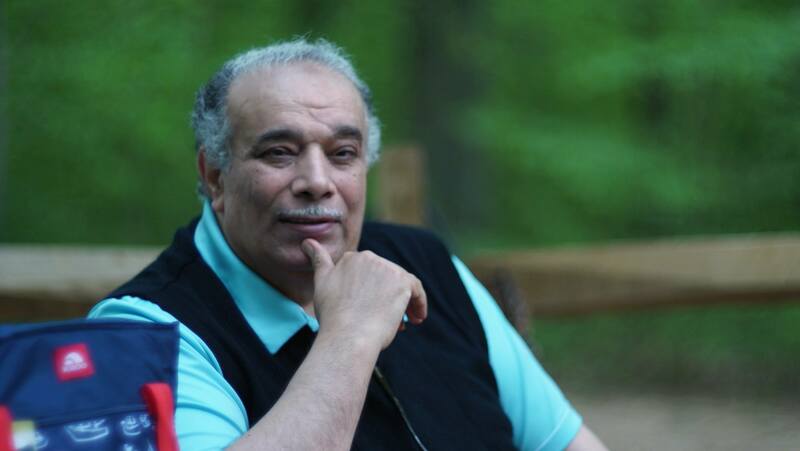 it was difficult to convince Kareem Diaa Eddine that the Azharite sheikh and the PhD holder Ahmed Subhy Mansour is actually a screenwriter who offered him three completed movie scenarios ready to be filmed. After his friends urged him enough, he read the three scripts, and to his great surprise, he actually admired them very much; he decided that his company would produce them in the production plan prepared by him. indeed, Kareem Diaa Eddine had at the time officially assigned the cameraman and director Tariq Al-Telmisany to direct the first screenplay of the first movie, titled by us "The Pharaohs 30", but Kareem Diaa Eddine changed its title into "The Camel and the Camel-Driver". This movie script is tackling the rural life in Egypt before the germs of Wahabism invaded and contaminated Egypt. We actually signed a contract selling this script to Kareem Diaa Eddine, and we have received a down payment, while the rest of the money due to us would be received at two installments: one would be paid after the Egyptian Governmental Censorship would allow the shooting of this scenario and the other when the shooting of the movie would be completed. Kareem Diaa Eddine was optimistic and promised to produce the other two scripts of mine as well. Yet, shooting the movie never took place; Kareem Diaa Eddine lost loads of money when he produced and directed his last movie, titled "Hassan and Aziza: National Security Case", and after the movie was poorly received by audience and critics, he perceived that the unfavorable artistic climate at the time (1990s) will not welcome serious movies like the scripts of ours, and he had to postpone shooting the movie, whose script we sold to him, until further notice. Kareem Diaa Eddine sympathized with us and gave us the rest of installments of the money due to us. 4- The Egyptian State Television has been, and remains until now to be, the major and most vital tool in the media used to spread the Wahabi extremist culture of terrorism, that has hijacked the name of Islam, all over the Egyptian society, a society which is already plagued by illiteracy, cultural illiteracy, and scientific illiteracy. Such a society is being inculcated certain consumerist and Wahabi notions through TV. Sadly, most TV viewers in Egypt do not watch news, cultural shows, and scientific shows, but focus instead on entertainment shows and TV series that divert them immensely and they talk about them in daily chitchat. Hence, TV series formulate certain (bad and corrupt) concepts into their minds unconsciously, implicitly sometimes and explicitly some other times, but intentionally all the time. Hence, the Salafist/Wahabi trend that dominates Egyptian censorship and TV transmission was given leeway to inculcate its concepts and notions into the minds of Egyptian viewers through period drama series (which depicting history) produced in the last 30 years and aired on Egyptian TV channels. It is not surprising that the scriptwriters of such period drama series are ignorant ones who know nothing about the period/era and the historical figures they tackle in these TV series. Such scenarists have been chosen specifically to interpolate Wahabi notions (especially about theocracy/caliphate) that will make viewers deify and sanctify ancient theologians and imams/scholars as infallible saints and to glorify caliphate era, aiming to make viewers yearn and long for reviving caliphate in Egypt, thus paving the way to accept Wahabi theocracy, i.e., the rule of terrorist MB and Salafists who seek to rule Egypt one day. The late genius filmmaker Radwan Al-Kashef was the one who advised us to write period drama TV series because they influence wider audiences and are the most popular tool, and this tool should be used to spread seeds of reform within viewers. Al-Kashef told us that people would be intrigued to find an Azharite sheikh who have written such screenplay that is based on his specialty field (Muslim history). Thus, we have begun our project of turning Muslim history into period drama series. We have now perfect knowledge about minute details of the history of Muslims/Muhammadans in the mentalities/mindsets, intellectual, linguistic, religious, cultural, social, and civilizational aspects. 5- Enthusiastically, we began to research historical accounts of less known figures in Muslim history, as a type of challenge for us as a history researcher and a Muslim thinker. Soon enough, we have turned these research papers into material for more screenplays and scripts. We have filled in the gaps within the historical accounts using our creative and artistic imagination, as we interpolated certain characters and events as per our understanding of the era we are tackling in the script, with its typical figures, culture, mentality, customs, traditions, how people used to talk, dress, eat, and interact socially, etc. The first research papers/stories of us tackled female historical figures, and many of these stories have been published by the two Cairo-based magazines, "Hawaa" and ''Sotor'', and this series of articles was titled "Women between the lines of history". The editor-in-chief of ''Sotor'' asked us to write another series of minor or less known male figures between the lines of history. Later on, we have written full-fledged scripts and screenplays based on these research papers, within our project that we have called "the project of turning Muslim history into several period drama series". 6- The series of articles containing historical narratives written by a Muslim historian specialized in Muslim history piqued the interests of many Egyptian literary figures; some literary magazines celebrated our writings and published opinion-articles about it, praising our literary sense of historical events and figures, and how Muslim history is an excellent source to write TV series and movies. Our views on that topic were copies in literary articles in Cairo-based magazines like ''Al-Hilal'' and ''Al-Qahira'', especially our views on how ignoramuses write period drama while committing fatal mistakes ad offering most erroneous views, because they ignore the era and historical figures about which they write their screenplays, and these articles have quoted the examples we provided about such errors, and how that the problem lies in the stern governmental censorship and the intentional ideological trend of glorifying and idealizing the past without criticizing it, thus promoting and supporting extremism, fanaticism, and Wahabi corrupt notions. 7- Our series of articles (published in "Hawaa" magazine) about women during the era of Harun Al-Rasheed, the Abbasid caliph, piqued the curiosity of one of the veteran and most famous writers of period drama in Egypt, the late Abdel-Salam Ameen, who stole many of our ideas in his screenplay to the TV series aired on Egyptian TV in the 1990s titled "Harun Al-Rasheed". Of course, this late scriptwriter was 100% sure that we have written about real historical figures who were minor ones mentioned accidentally between lines of historical accounts, with the same names and traits. Yet, he did not know that some of such stories of female characters he stole from us were the figment of our imagination to fill in the gaps in historical accounts, and we had to create such characters to explain certain historical events by thickening the plots of our stories based on history in a way that will match perfectly the era we have tackled and its culture, to explain what is hushed up or what historians had to remain silent about, when they chronicled certain events. Indeed, we could never sue Abdel-Salam Ameen or expose him in our articles in any newspaper or magazine; we suffered at the time many types of persecution inflicted by Al-Azhar and the Egyptian police and National Security Apparatus officers, apart from discrimination by the extremists among the masses in the district where we used to live (inciting people within loudspeakers of mosques on Fridays to assassinate us as an infidel and a denier of Sunna! ), and we hardly needed more enmities by creating new enemies. Another reason for our silence was the power and authority of our foes, they had influences and connections in the judiciary system and in Egyptian media, within circles of political figures, etc. and such cronies of corruption cannot be faced by ourselves alone, especially that we have been chased by extremists and watched closely by the Egyptian authorities of Mubarak. Hence, we could never defend ourselves and sue Abdel-Salam Ameen for plagiarism. It is noteworthy that Ameen was highly praised in Egyptian media though he did not deserve it, and he was encouraged to write another period drama filled with mistakes and errors this time; he wrote the screenplay of a TV series titled "Zu Al-Noun Al-Masry" about the well-known Egyptian Sufi man who carried that name. but because Ameen never knew anything about the Abbasid history except what he plagiarized from us about women of the era of Harun Al-Rasheed, he committed the error of making this Sufi man living during the caliphate of Al-Rasheed, because Ameen never knew that Zu Al-Noun Al-Masry was born 15 years after the death of Al-Rasheed. Again, this TV series was much celebrated and its screenwriter, Ameen, was hailed and praised in Egyptian media. 8- Our project of turning Muslim history into several period drama series took many stages, beginning with strange, interesting stories which are less known to the general public and at the same time would not cause trouble for us with the Egyptian Governmental Censorship, and also so as to establish our name as a screenwriter first, and in later stages, we would gradually introduce in other screenplays the negative aspects of history which we would like to criticize. With the help of some friends, we managed to get an appointment with one high-rank employee in the production section inside the National Egyptian Television and Radio building, in Maspero street overlooking the Nile, in Cairo. We brought along with us one of our screenplays that was praised by employees there who read it before meeting us. Yet, one of the panel of writers who read our work was an old veteran screenwriter who screamed at us saying: "Are not you Ahmed Subhy Mansour? The writer who hates the companions of Prophet Muhammad and verbally abusing them in your articles in newspaper?!". Hence, my screenplay was rejected. We never despaired; Dr. Saad Eddine Ibrahim, who employed us in his Ibn Khaldoun Center, helped us to contact the Minister of Information at the time, Mr. Safwat Al-Sharif, as the minister was at the time angry with the Azharite control of TV series of period drama, and he agreed to let us send him copies of our screenplays that should be turned into period drama TV series. We attached with our works of drama a letter addressed to the minister (this letter is found in the ANNEX after this article below). All this came to nothing; the Saudi influence over Egyptian State TV was greater and deeper than any temporary fury of a veteran minister who was very close to Mubarak. 9- Simultaneously, our project of reforming Egyptian religious education to make it urge tolerance, a project sponsored by Ibn Khaldoun Center, after reading our ideas and proposals published in articles in (the Cairo-based, Marxist/Leftist) Rose Al-Youssef magazine and other newspapers, was attacked by most journalists in Egyptian press. Our ideas have included alternative curricula for religious education to replace Azharite ones (in Azharite schools and public schools) that incite extremisms, hatred, and fanaticism. At the same time, we have written a screenplay of a short documentary movie about the festivities celebrating the birth of Virgin Mary in Egypt, held in Mostorrod District, near our residence in Matariyya District, and how such occasions embody the tolerance of Muslim Egyptians and Coptic Egyptians who attend such festivities, despite the existence of Wahabi fanaticism and its influence spread all over Egypt. Another short documentary movie screenplay was written by us about religious tolerance in Egypt throughout history. Both movies were produced by and aired inside Ibn Khaldoun center and the cultural elite members were astonished and happy to watch both movies as they link past and present, and history with contemporary events, and provide less known facts. Yet, Egyptian TV censorship refused the offer to air the two movies for free. 10- Soon enough, our project to reform religious education and the other project of raising awareness of Egyptians about their political rights and regarding elections had to be opposed and stifled by the Mubarak regime: Quranists were arrested, the ones linked to Ibn Khaldoun Center and others, and the center was closed down by the police. Dr. Ibrahim was arrested in 2001, and we expected to be arrested anytime. Our last hope within such threat, being chased and watched closely wherever we went, and within our abject poverty, and before we decided to immigrate and take flight to the USA as a political asylee, was to contact our friend, the famous Egyptian screenwriter Waheed Hamid, to seek his help to sell one of our TV series screenplays to the Egyptian TV production sector. Our eldest son, Muhammad Mansour, helped us in preparing a long many-season TV series that tackle highly entertaining tales from Muslim history, and the series was titled "Anecdotes of Ibn Eyas". Ibn Eyas was one of the most famous Middle-Ages Egyptian historians, and he used to hold meetings with his friends to narrate historical accounts to one another. We have written this screenplay in a way so that the anecdotes would tackle many eras in history of ten centuries from the era of Muhammad to the era of Ibn Eyas. After writing ten episodes of this TV series, using the name of our son as a pseudonym: Muhammad Ahmed, Waheed Hamid helped us to present the written episodes to the production sector in the Egyptian TV. The State TV Governmental Censorship endorsed the episodes and given its consent and approval, while enclosing a note asking for slight modifications and requesting to read the rest of the episodes once finished. Yet, once they knew the real author of the TV series screenplay, the project came to a halt, and officials prevented us from ever entering the State TV Building, in Maspero Street, by the commands of the State Security Apparatus officers, who were busy trying to frame us by accusations of showing 'contempt' of religion, and they had already arrested some of our relatives and family members and other fellow Quranists and other friends. We took the flight to the USA in Oct. 2001 before they could arrest us, carrying with us all our unpublished books and screenplays and ideas for enlightened TV shows. Of course, most of our articles on religion and on history is being published on our website (ahl-alquran.com) and the Modern Discussion Marxist website (ahewar.org); but our screenplays are unpublished yet. Many of our articles were formerly part of the project of turning Muslim history into period drama TV series, that include two main steps: (1) researching historical figures, and (2) turning the research into historical tale and then into a TV screenplay. We currently have tens of complete screenplays, ready at once to be produced as TV series and movies. We have also summaries of scenarios, along with some episodes that we hope to be able to finish one day. There are still some unfinished screenplays, with dramatic plots ready and prepared for them. We have also some ideas on paper that have not yet been turned into screenplays. These writings were done in Cairo, Egypt, before we settle in the USA; many of the unfinished screenplays need to be rewritten because we no longer now fear any governmental censorship or persecution/terrorism of the religious extremists and the Mubarak regime, as all these factors influenced our writing at the time. As for the themes of the screenplays for TV and cinema, there are some that tackle contemporary life socially and politically, within romantic, realistic, and comic veins. Those ones will be the basis to face Wahabi extremism spread in Egypt by revival of (and raising awareness of) Egyptian nationalism that must supplant Wahabi culture in Egypt. This way, as Wahabis have used TV series to corrupt Egyptian life and citizens, both can be corrected and reformed by 100% Egyptian-culture TV series. Until now, we still are trying to market our screenplays to spend money on our IQC and our Quranism website. We invoke al enlightened people in the field of drama and movies production to cooperate with us in this respect, and they will be handsomely rewarded. Indeed, we seek to make our website and IQC go on without having to raise funds or to beg for money from anyone. May God come to the aid of us all. 1- In fact, the Muslim and Arab heritage books are divided into two sections: (1) one filled with problematic areas, disputes, thorny issues, divisions, and political strife: interoperations of the Quran, hadiths, fiqh, theology, and tenets, causing 'Muslims' to divine into Shiites and Sunnites and their sub-doctrines and sub-creeds, and (2) one that is free from problems and filled with refined culture, moral lessons, and useful information, related to Muslim history, civilizations, literature, social life, etc. It is this second section that can be turned into period drama TV series, as it is rich with events and human/dramatic stories, as countless books of history tackle them within the eras stretching for ten centuries from the first century A.H. until the end of the Ottoman Era. 2- The writer of these lines is a specialist in heritage, history, and religious tenets of Muslims as well as their social, legislative, and intellectual life in these historical era. As for the problematic aspect filled with controversies, it is talked by the authors non-fiction more than twenty books and more than 300 articles to reform religious thought in Egypt using the Quran to clear the name of Islam from accusations of terrorism, obscurantism, and fanaticism. Our intellectual endeavors were rewarded by being persecuted and we had to tender our resignation, as an assistant professor, from Al-Azhar-University in 1987 in order to go on with our intellectual project of showing true Islam and criticizing traditions. 3- As for the section of problem-free Muslim history, the author of these lines has turned many parts of it into screenplays to be filmed as movies and TV series, by dramatizing many events and historical figures in a very interesting way that will captivate hearts and minds of Egyptian viewers. Some of such materials have been published as tales in article form in many magazines and newspapers inside and outside Egypt. Indeed, some famous Egyptian screenwriters whose TV series were aired on Egyptian TV have made use of our published writings, and we can prove this with tangible evidence and documents. 4- In our project to turn history into TV period drama series, we not only focus on less known aspects of history and historical figures, but also on what we call as third-level figures; the first-level figures comprise rulers and imams that form headlines in history books, the second-level figures include rulers' retinue members, leaders, governors, employees, scribes, etc., and the third-level figures are less known followers and persons whom little is known about them between lines of history, but they had a certain measure of influence on events. The real challenge for any real researcher is to focus on these third-level figures within between lines of tens of historical references, accounts, and books, to glean as many information about them as possible and to fill in the gaps with dramatic imagination creatively to write excellent scripts. This entails that the screenwriter/researcher must analyze the gleaned material to write excellent research that will be the basis of a top A1 screenplay fit for a great period drama TV series. Of course, creative writings gives the researcher freedom to break away from firm rules of objective research to analyze gleaned information to fill in gaps of history for the sake of drama, as per researcher's understanding of the era and its aspects, since this is our specialty, unlike the case of research writings that must be based on facts alone and entail minuteness, accurateness, and verification. Hence, the historical figures that appear in our screenplays and scripts are vivid with life and very realistic and true to the customs, traditions, language, culture, etc. of the eras we tackle. 5- In fact, all the TV series of period drama aired on Egyptian TV channels are filled with errors and mistakes, despite the fact that their screenwriters focus on first-level figures on whom history supplies us with ample information. Let us provide few examples here. In the TV series titled "The Knights", there is a scene of Qotoz meeting Hulago. This encounter never occurred as far as historical accounts are concerned; in fact, history tells us that Hulago left the Levant in 658 A.H. to face familial troubles in his capital that threatened his throne, leaving Katubgha, his military leader to face the Egyptian armies led by Sultan Qotoz, who defeated the Moghul armies led by Katubgha. When news of defeat reached Hulago, he commanded the massacring of all Muslim/Arab captives he had and those who were his allies, except for one man whom the wife of Hulago interceded on his behalf to spare his life (see Al-Hamathany 2/1/308-316 and Al-Makrizi 1/2/427-434). Another glaring example is the grave error committed by screenwriter Abdel-Salam Ameen in his TV series titled ''Zu Al-Noun Al-Masry'', as he claims in his screenplay that this Sufi figure lived during the era of the Abbasid caliph Harun Al-Rasheed and actually met him. Yet, history tells us that when Zu Al-Noun Al-Masry travelled to Baghdad, he met the caliph Al-Motawakil, the grandson of Harun Al-Rasheed. Zu Al-Noun Al-Masry died in Cairo in 246 A.H. and historians assert that he was 60 years old when he died; this means he was born c. 185 A.H., 15 years after Harun Al-Rasheed died. Hence, Abdel-Salam Ameen has ignored all sources about the life of Zu Al-Noun Al-Masry, such as the following: Tabakat Al-Sufiyya by Al-Salmy p.12, Hilyat Al-Awliyaa by Al-Isphahany 9/331, Al-Resala Al-Qosheiriyya 1/54, Histroy of Baghdad 8/393, Al-Ansab by Al-Samaany 1/22, Al-Makhtotah Al-Dhahiriyya a manuscript no. 3450-6-74b, Waffiyat Al-Aayan 2/437, Al-Nojom Al-Zahera by Abou Al-Mahasin 2/320, Husn Al-Muhadarah by Al-Siyouti 1/511, Shazarat Al-Dhahab by Ibn Emad 2/107, and Al-Aalam by Al-Zarkarly 2/88. 6- Indeed, our books of history, tradition, and heritage are filled with treasures for competent screenwriters, and rich material can be presented to the viewers that will take pride in such TV series in the age of globalization. Yet, such treasures will not be appreciated unless specialists, like the author of these lines, will write scripts that make good use of such rich material and present them in an acceptable, accessible way to Egyptian viewers without distorting historical events or offering misleading notions. Our great history deserve better ways to be presented faithfully for the benefit and entertainment of Egyptian viewers. Egypt must be the pioneer of period drama TV series as a great country deserving such stature before any other Arab country. It is very insulting to Egyptian arts that historians would write articles about the so many errors committed in many period drama TV series that were aired on Egyptian TV. This is why we did not wish to talk in our articles about plagiarizing and distorting our ideas and distorting history on purpose on Egyptian TV series; instead, we stretch our hands to the Egyptian State TV, the TV of our beloved country, to cooperate in presenting Muslim and Egyptian history in the best way possible on Egyptian State TV channels. 7- The Egyptian State TV employees have to present period drama TV series screenplays to Azharite employees to endorse them, despite the fact that these Azharite employees are ignoramuses who know very little about Muslim history. Evidence: countless errors in all period drama produced so far that they have endorsed and allowed to occur. Because such Azharite employees are traditionalists, they hate the guts and the very name of us, Dr. Ahmed Subhy Mansour, because of our intellectual endeavors and criticism of ancient traditions and books, and they will refuse to read screenplays written by us. We are to present our works to them using the pen-name: Muhammad Ahmed. May God come to the aid of us all. N.B. : We have sent this memo to Mr. Safwat Al-Sharif in the late 1990s, and we have never received a reply from him; it seemed at the time that he was very busy and deep in thought over one topic of vital importance: would it serve his purposes that Mubarak would go on ruling as president or that Mubarak's eldest son would succeed him as president, or both things together!